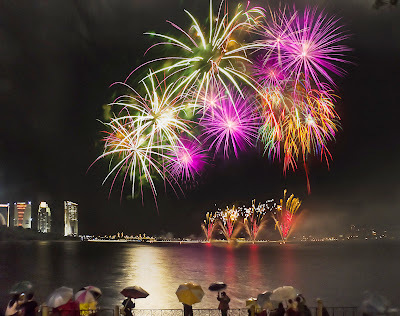 A little trip to Putrajaya last night to watch the Putrajaya International Fireworks Competition 2013 to relieve stress. 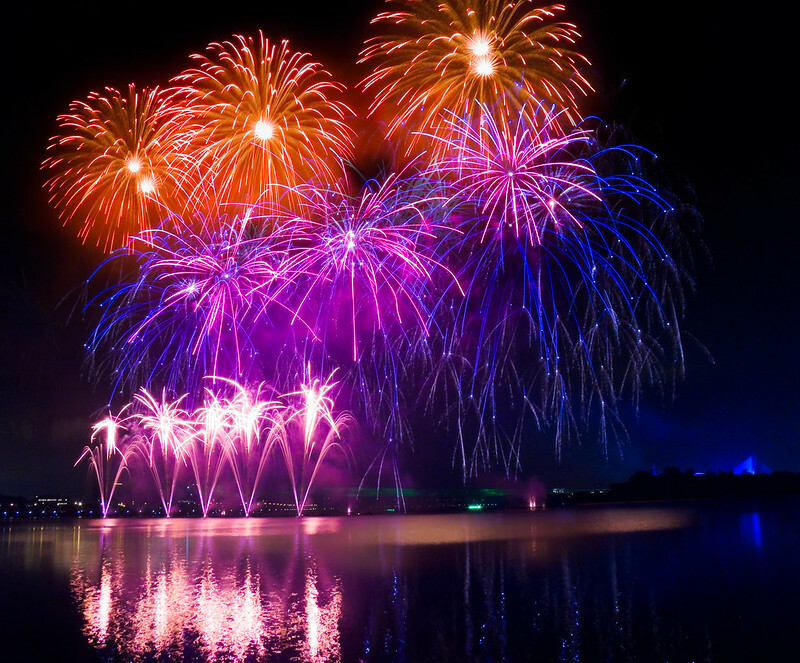 This competition, which is part of the Pyrobeat Festival 2013, sees six teams competing in a fireworks and music extravaganza in order to win the judges over. 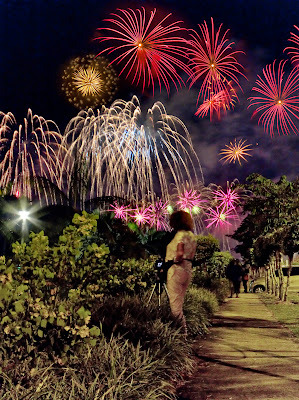 Last night was Team France; the fireworks display lasted for about 25 - 30 min, so naturally many spectators come armed with cameras or flashed out their pads and phones to click away. Fireworks by Team France. This was after the smoke had somewhat cleared. Team France's colourful fountains and fiery balls. The schedule for the competition and events are as shown in the picture below. There are many spots where one can view the display from, from paid premium seating to free park and picnic spots all along the lake facing the Marina Putrajaya. 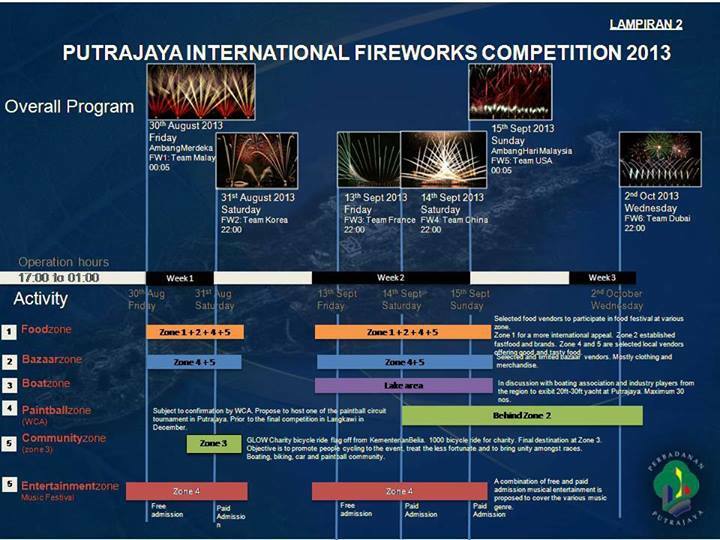 Program schedule for the Putrajaya Fireworks Competition. 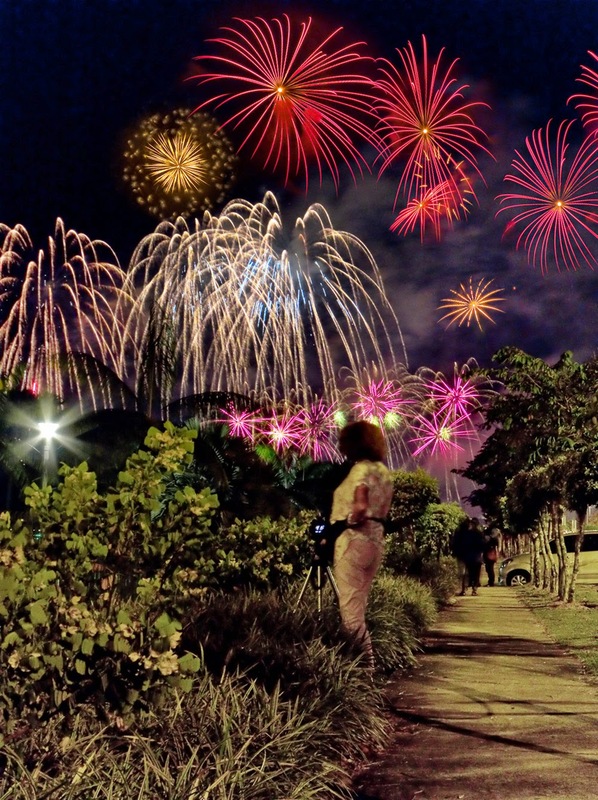 Note the time that the fireworks show start (either 10pm or midnight). The yellow areas are free, public viewing areas along the lake at Precint 5. So if you are free, do go and have a look. The spot that I went to last night even had portable toilets set up nearby, although I didn't notice it at first and had walked for more than a kilometre along the lake to a proper toilet. Many parents brought their kids along and treated it like a family picnic, with some parents fighting with their kids to play Candy Crush on their pads/phones whilst waiting for the show to start. PS: Team China was on the 14th. Unfortunately, the sky drizzled continuously through the entire show, with many having to watch under the cover of umbrellas. Team China. It was drizzling so many came armed with umbrellas. Not many good photo shots as the raindrops messed up many of mine. PPS: The show on the 15th was supposed to be at midnight, but was changed to 10pm. The poster was only posted on Perbadanan Putrajaya's facebook page like 12 hours before the event, and that also if you scrutinise the poster, will you notice that the time slots are all at 10pm. Luckily, we got there just in the nick of time. Many people were disappointed and Putrajaya's facebook page had a lot of angry rants against them. Team USA: They used Disney's music to accompany their fireworks display. The road at Persiaran Tasik Cyberjaya came to a standstill, with many getting caught off guard by the earlier showtime. Not a problem since everyone just leaves their cars parked on the road to watch the show. There were many red and blue ones, but I missed out capturing it since we just got there and spent some time setting up. Big white balls from Team USA for the finale of the show. Team USA is actually Disney's fireworks team, and they do put up a spectacular show that is lovely to photograph. 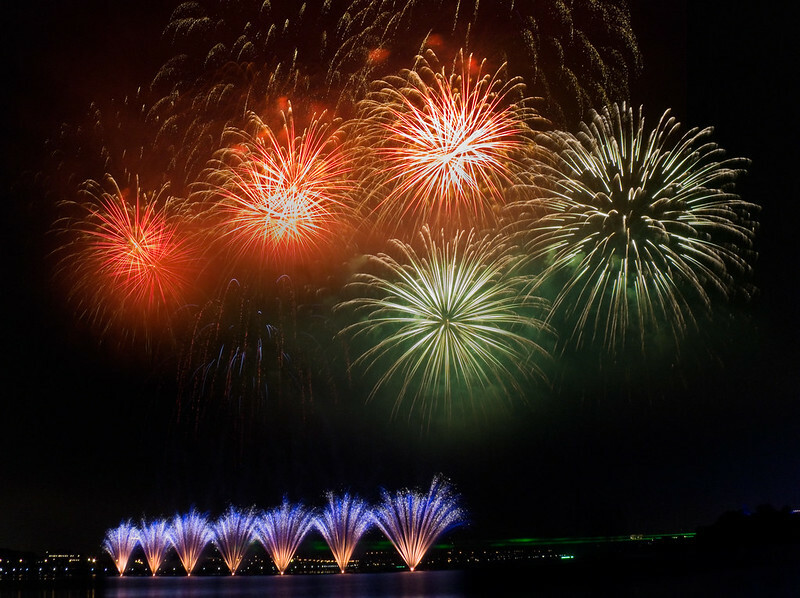 The last round of the fireworks will be Team UAE on the 2nd Oct at 10pm as per official poster. So one more chance to catch almost half and hour of fireworks free at Putrajaya. 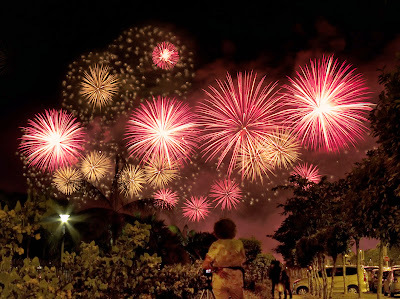 Masa duduk Jepun dulu rajin pergi tengok fireworks during summer. 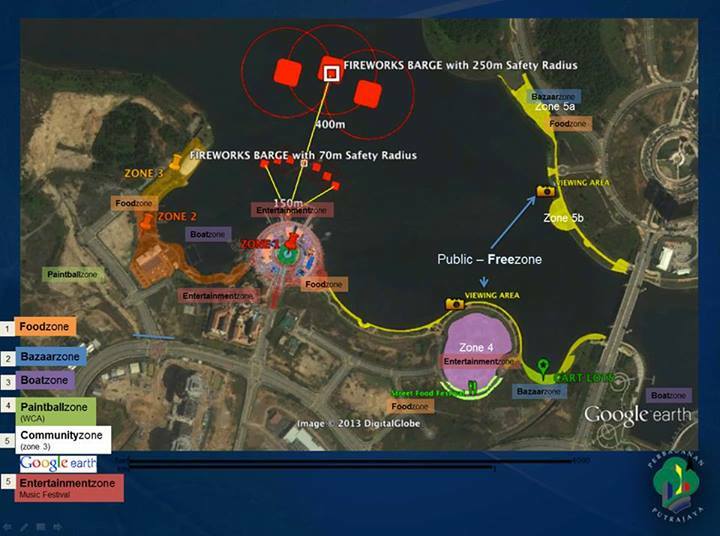 Bestnyer dapat tengok fireworks. 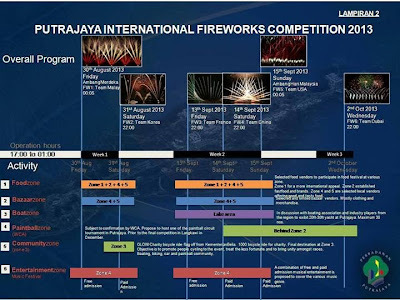 Jom, hari Rabu ada satu round lagi fireworks.